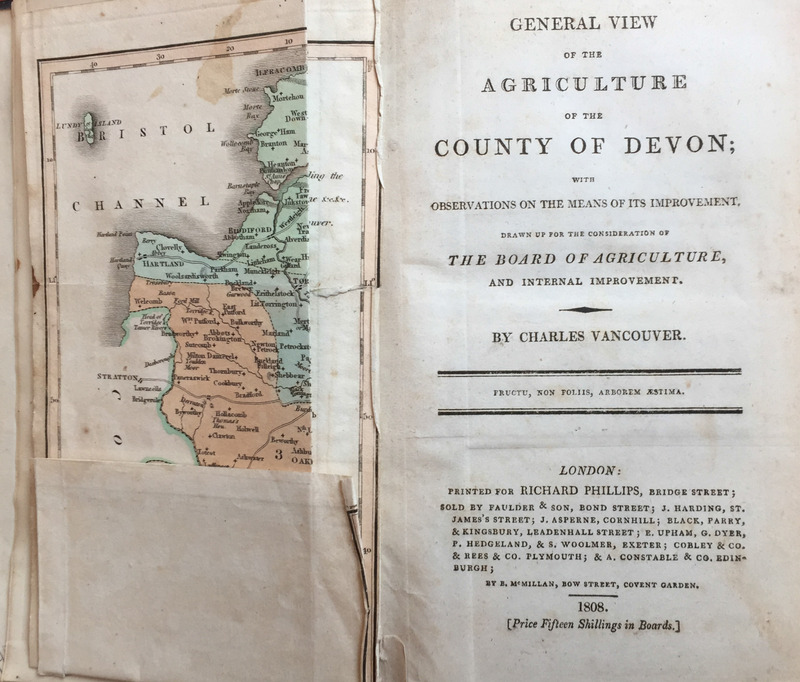 Charles Vancouver’s General View of the Agriculture of the County of Devon  written in 1808 is a widely cited source with regards to grazing and potential agricultural improvements on the Dartmoor Commons. 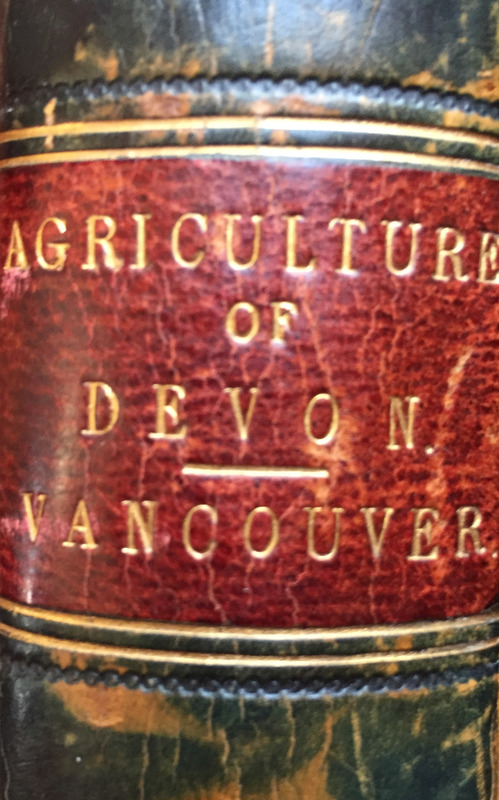 Vancouver’s book is an amazing treatise on the state of agriculture across Devon in the early 19th century and while much of its focus was on agricultural improvement it contains several sections about the grazing potential of the Dartmoor Commons. The depasturable parts of the forest, consist of a black moory soil, from eighteen inches to two feet in thickness, generally forming peat below, always highly charged with moisture, and ultimately resting upon a reddish-coloured argillaceous loam, called fox-mould, and which is also retentive of water in a very high degree. The spontaneous vegetation of this part of the forest, among many other herbs and grasses, consisted of purple melic grass, mat grass, downy oat grass, bristle-leaved bent, eye-bright, bulbous rooted rush, common termentel, smooth heath-bed straw, common bone binder, cross-leaved heath, common heath or ling (dwarf), milk-wort, dwarf dock and agrostis vulgaris in very large quantities. The disturbing of this herbage, however inferior it may appear in the eye of the refined agriculturalist, is on no account whatever to be recommended to permitted. Vancouver goes on to describe the importance of the ‘wet peaty moors’ for grazing by sheep and cattle. Mercer (2009) comments on these high sheep numbers suggesting that the Commons of Widecombe and Buckland today amount to 1032 ha. and therefore in 1808 were subject to a grazing pressure of over 2 sheep per ha. My own research concludes that the two Commons amount to 1940ha., nearly twice the area Mercer states. With regard to the cattle we are left unclear on their stocking density but Mercer (p292) states that Vancouver described them as standing ‘shoulder to shoulder’. These two Commons account for around 5% of Dartmoor’s Commons, so if we take an estimate that there were 10,000 cattle on the Commons of Dartmoor in the early 19th century we could speculate that there were 500 (5%) on these two Commons. By doing this we are then able to construct some grazing pressures, measured in Livestock Unit (LSU) where 0.15 sheep equates to 1 bovine, which we can then compare to those seen in the modern era. over 1940 ha of Common = 1.34 LSU / ha / year. Many studies have been published which seek to recommend appropriate grazing levels on upland grasslands and heaths. The majority of these have been carried out either in Scotland, the Peak District and the Pennines. In north-east Scotland a grazing pressure of 0.2 cattle and 2.7 sheep / ha (this equates to 0.605 LSU / ha ) caused damage to heather communities. Additionally, with cattle at 1.2 / ha (1.2 LSU / ha) there was a 32% decline in 4 years and a decline from 80% to 5% heather cover in 10 years. With 5 sheep / ha (0.75 LSU / ha) there was a 9% decline in heather cover over 4 years (Welch 1984). A grazing pressure of 2 sheep / ha (0.3 LSU / ha) on heather moorland and 0.37 sheep / ha (0.055 LSU / ha) on blanket bog was considered to be compatible with nature conservation objectives. Whilst 0.5 sheep / ha (0.075 LSU / ha) on heather moorland and 0.1 sheep / ha (0.015 LSU / ha) on blanket bog was required for heather to regenerate (Evans & Felton 1987). On the face of it the grazing pressure reported by Vancouver is in excess of that which modern research found that habitat damage would occur. However Vancouver reported both cross-leaved heather and ling as being notable in these pastures. The situation is further complicated as Vancouver also reports the following. The sheep in question here are White-faced Dartmoors, these sheep were being raised to produce wool and mutton. The wethers were the principle producer of wool fleeces and may have been kept for up to 6 years. The key factor in the above text is that they were being overwintered on the moor. It is widely assumed that all-year round grazing on Dartmoor did not occur until the late 19th century and the early 20th century when Scotch Black-faced sheep and the Galloway cattle arrived. It would appear that the practices of transhumance (summer grazing and winter resting) along with levancy and couchancy – the rule that determined the number of grazing stock that could be summered on the Common by reference to the capacity of the land to which the rights were associated to feed stock over the winter months, i.e. all stock on the Common in the summer had to be accommodated and fed on the farm in the winter months were already breaking down. If we assume that that the wethers accounted for 8000 of the 14,000 sheep (‘the greater part’) then we need to add an additional 1200 LSUs in to the calculation. over 1940 ha of Common = 1.96 LSU / ha / year. Additionally Mercer (p303) quotes Vancouver who reported seeing ‘knee high grass’ on the Widecombe Commons in May. Ample grazing at the beginning of the growing season and scarcely half consumed in November. The south and east quarter are the driest and best for sheep, and from the most accurate information I could obtain, there are not five thousand sheep kept on both these quarters. Certainly not so many on the north and west. So that if we say 10,000 sheep for the whole of Dartmore, we shall be beyond the mark. I think there are not 8,000 in the whole forest in any summer. However, Fogwill (1954) in his essay on Pastoralism on Dartmoor stated that in Annals of Agriculture there is a footnote stating that ‘this a great error’. 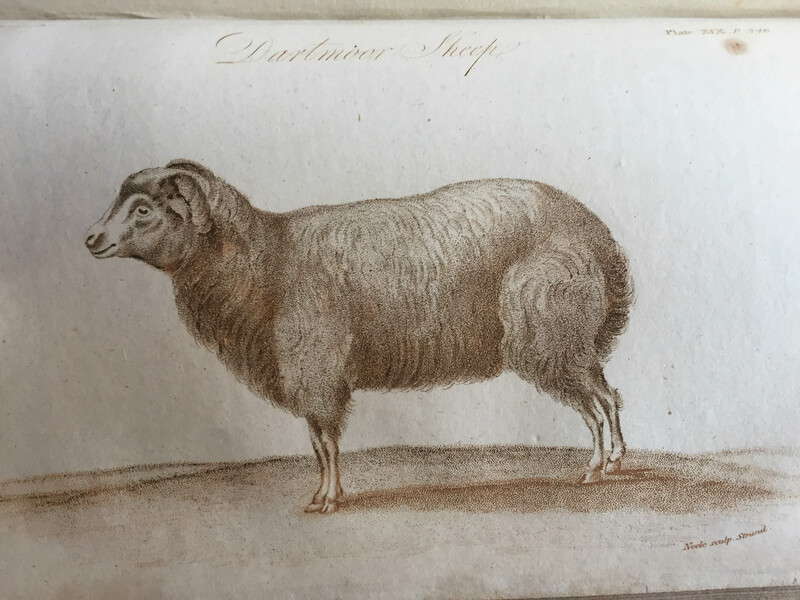 It is difficult to unravel this mystery and we may never be able to do so: perhaps the gentlemen of the parish miscalculated the number of sheep; perhaps the 14,000 sheep were not solely on the Commons or perhaps the breeds of animals involved i.e. the White-faced Dartmoor sheep and the Ruby Red Devon cattle impacted less severely on the vegetation than Scotch Blackfaces and Galloways. Or maybe, just maybe, in the time before the Industrial Revolution began, before the era of atmospheric pollution and climate change, the hill-farmers of Dartmoor had perfected a system of pastoralism which allowed them to graze the Commons with great numbers of animals without damaging the vegetation. Evans S. & Felton M. (1987) Hill livestock compensatory allowances and upland management. In Bell and Bunce (1987) pp66-72. Fogwill E. (1954) Pastoralism on Dartmoor. Transactions of the Devonshire Association 86: 89-114. Welch D. (1984) Studies in the grazing of heather moorland in North-East Scotland. II. Response of heather. Journal of Ecology 21: 197-207. This entry was posted in Dartmoor Farming, Uncategorized and tagged Charles Vancouver, Commons, Dartmoor, Sheep numbers. Bookmark the permalink. The proposal that “Welsh farmers are being urged to obtain a true picture of the disease in wildlife” has its limitations. (News Lauren Dean 12 March 2018). With badgers travelling over10 miles from their setts, the location of a single infected badger, is not necessarily a local badger and will spike the evidence. On the other hand the ill badger-the super excreator with 1,500,000 bTB bacilli in every teaspoonful of urine, being ‘confined to barracks’ is unlikely to be included in the survey. Never mind having to transport these badgers 80+/- miles to the lab. When would the results be in the public domain? Is this survey necessary or just another time consuming charade? It is already accepted that bTB infected badgers are acting as the reservoir of infection responsible either directly or indirectly for 90% of breakdowns in cattle. Since 2 or more years will elapse from the time infected badgers occupy an area and the first herd break down occurs, the badger survey should be extended to the low risk regions of the UK, to confirm the bleak picture that I suspect. A far more informative method, would be to actually identify the infected setts using Polymerase Chain reactor (PCR) developed at Warwick University by Prof. Liz. Wellington, who having received £millions in funding refuses to release PCR for use with badgers.. She is not satisfied that infected badgers are involved.in the transmission of bTB!! Their availability would not only be good publicity for Warwick but also a good earner. Having identified the infected setts the dormant badgers could then be fatally anaesthetise using Carbon dioxide, generated from ‘dry ice’. Just as pigs and poultry are routinely anaesthetised prior to bleeding out now. However any animal is culled its welfare will be compromised. The most welfare friendly method must me the method of choice. No doubt that this method is “the viable alternative to shooting badgers the Derbyshire Wildlife Trust” had in mind. In promoting shooting as the method of choice, the previous CVO because injury rates were comparable with those of stalked deer. Having seen the evidence of the horrific injuries sustained by stalked deer, during the hunting debate, when few deer were killed outright, the CVO was not justified in peddling shooting badgers as the method of choice. To even bring bTB even under control, never mind the crass over optimistic target of eradicating bTB in 20 years, there will have to be an efficient targetted cull of the infected badgers. Only healthy badgers will result in healthy cattle. Justifying the reported extension of cull licenses the “Chief Vet said proactive culling remains the best evidenced available option”. It is the only option. It is ominous that Defra Secretary M. Gove, even has one ‘anti cull’ member on the Board never mind appoints another in Ben Goldsmith. This must be the opportunity for the NFU to finally take the initiative and become proactive, instead of just ‘rubber stamping’ Government policy, by using “every available option to tackle the disease including cattle testing, movement controls, biosecurity and vaccination”. If sound common sense was included and all political dogma excluded then some progress would be made. Sitting in NFU HQ the then Vice President with a sweeping hand indicating the building said “ In this magnificent building the NFU are not a pest control organisation”. The NFU must be the catalyst. In spite of having the evidence that “Vaccination of badgers does not prevent infection” it is still peddled by the NFU. There is already too much cattle testing- particularly the use of the blood test. From my own experience the test is not only far too sensitive but also inaccurate. It results in an excessive numbers of reactors having to be slaughtered. Even in Australia where the test was developed, it is no longer used. Farmers must strongly resist having to have their cattle blood tested. when stock and badgers use the same outside ‘playground’ being virtually impossible. It must be frustrating and cannot be justified. Simple common sense things like things like making buckets of minerals difficult for badgers to access and turning over food troughs are cost effective, together with closing doors of feed stores and milking parlours. To house all stock including sheep, stop zero grazing, not knowing the survival rate of bTB in maize silage- having to stop feeding it, makes stock farming in practical. The Brigadier friend of the Welsh CVO told her “Identify the enemy, locate the enemy and then destroy the enemy” The army taught me to always obey the last order. It is not in the interest f the badger population to have any bTB in their social groups never mind 72%.(Broadway). Those that oppose any cull on principle, have either no concern for badger welfare, been brain washed and or corrupted by third parties.